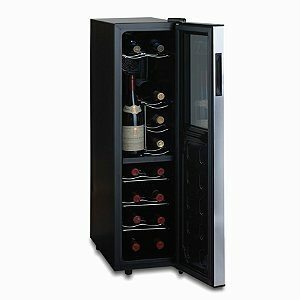 Whether you have a collection of fine wines or you just love to make your own wine at home, unless you have access to a wine cellar, a wine cooler is an essential household appliance. Similar to a regular refrigerator, a wine cooler is an appliance designed specifically for the preservation of the wines, being fitted with dedicated shelves and boasting some features that will keep your wine in the best conditions. On the market, there are basically two types of wine coolers to choose from, compressor wine cooler and thermoelectric wine coolers. This article is dedicated to the last category, explaining in detail the features of these units and listing some thermoelectric wine cooler reviews that should help you choose the best appliance. A thermoelectric wine cooler is a refrigerating unit that uses the Peltier principle to cool the internal area of the device. The principle, discovered in 1834 by the French scientist Jean Peltier is based on the physical action that creates a temperature difference between two metals that are connected while there is a flow of electric current between them. Basically, the thermoelectric cooling systems use two Peltier modules, also called thermocouples, that are made of different semiconductor metals placed between two planes made of ceramic. In this way, the Peltier modules conduct the heat out of the cooling system to a system of fans designed to remove the heat completely, while generating a colder temperature in the interior of the unit. The thermoelectric cooling systems are used for many household appliances but what makes thermoelectric wine coolers great is the lack of vibrations, providing an environment more suitable for preserving and aging your wines. Like any other appliance, the thermoelectric wine coolers have both advantages and disadvantages. Knowing all of them in detail will help you determine whether you should buy a thermoelectric wine cooler or if you should rather search for a compressor model instead. Silent and vibration-free: thanks to the different cooling technology used, the thermoelectric wine coolers are both silent and vibration-free. The first feature is desired above all if you want to place the wine cooler in the living room or home office since the unit will not bother you with any noise. The lack of vibration will improve the conditions in which the wine is kept, especially if you want to use the cooler to preserve your collection rather than to chill the wine before serving. Environmentally friendly: the thermoelectric wine coolers don’t use any harmful chemicals to generate cold air, so you don’t have to worry about the effects of the CFCs. compared to the compressor wine coolers. For this reason, they might be a suitable option if you have a little space in your house. Affordable prices: because the technology used for the cooling system is simpler compared to the compressor wine coolers, the thermoelectric wine coolers have more affordable prices. This could be a great advantage especially if you have a small collection of wines and don’t want to invest a high amount of money in such a unit. Limited cooling capacities: a thermoelectric cooling system is highly influenced by the environmental temperature. Most thermoelectric wine coolers can reach internal temperatures between 55 and 65 degrees Fahrenheit. In the case of some wines, they don’t get cool enough, but that is not the only downside. In fact, the thermoelectric wine coolers are, in most of the cases, unable to maintain a temperature that is more than 20 degrees lower compared to the outside temperature. This means that if you live in a particularly warm area, or if the temperature inside the room where you place the cooler is high, your wine will not be kept in the best conditions. For this reason, it is recommended to place the wine cooler in a room or environment where the external temperature does not exceed 77 degrees Fahrenheit. This will limit your options a lot. Another thing to pay attention to is to not place the unit in a sunny area. The direct sunlight will influence the cooling capacities of the unit because the warmth of the sun will raise the internal temperature of the unit. Limited placement options: because the thermoelectric wine coolers use a vent system to get the heat out, it is recommended to leave a space of at least a couple of inches between the unit and the wall. For this reason, unless expressly stated by the manufacturer, you can’t place a thermoelectric wine cooler in a cabinet or in other types of enclosed spaces. Consume more energy: the thermoelectric wine coolers have an almost constant operation, consuming more energy compared to the compressor wine coolers. If by now you are confused and unsure whether a thermoelectric wine cooler is a right choice for you, here is a comparison between the two types of cooling systems that should help you take the final decision. If you have decided that a thermoelectric wine cooler is a right choice for you, read the following thermoelectric wine cooler reviews to decide which unit to buy. A lovely thermoelectric wine cooler designed to enhance the décor of any kitchen or living room, this appliance fits perfectly anywhere in your house or cellar. The design is compact and stylish, yet this cooler boasts enough internal space to accommodate up to 24 standard size bottles. Designed to be both beautiful and functional, this thermoelectric wine cooler is composed of a lower part destined to the bottles and an upper drawer designed to keep all your wine accessories at hand. Another great feature is the dual zone cooling, that will allow you to preserve in the best condition a collection of both red and white wines. Dual zone cooler: the upper part of the unit has a capacity of eight bottles and can keep your wine at temperatures between 45 and 54°F. The lower part, with a capacity of 16 bottles, has a range of temperatures between 54 and 65°F. Granite top: adding a touch of elegance to any interior design, this unit has a granite top that can be used for multiple purposes. Locking door: you can keep your collection safe from any unauthorized access thanks to the locking cabinet door. Dark glass door: to keep your wine away from the UV light, this unit is equipped with a dark glass door. Although the manufacturer states that the upper zone can cool to 45°F, this is very unlikely especially if you place the wine cooler inside the house and not in a wine cellar. With a sleek and modern design, this thermoelectric wine cooler from Wine Enthusiast is suitable for wine collections up to 18 bottles. 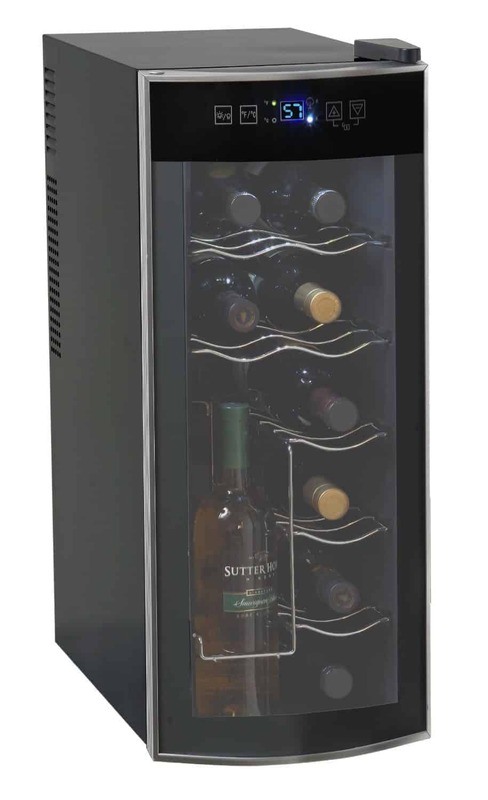 Designed as a dual zone wine cooler, this unit can hold up to 10 bottles in the upper zone and up to 8 bottles in the lower zone. The temperatures vary between 46 and 66°F in the lower zone and 54 to 66°F in the upper zone. A nice feature of this thermoelectric wine cooler is the standing bottle space in the upper compartment, which will allow you to safely store an already opened bottle of wine. Digital temperature control: setting and controlling the temperature is easy thanks to the external digital controls. Reflexive glass door: you will be able to admire your wine collection while keeping it safe from the UV radiations, thanks to the smoke-gray reflexive glass door. Removable shelves: the wine cooler is equipped with seven chrome shelves that can be easily removed if you want to change the internal configuration. Slim design: this freestanding unit has an incredibly small footprint, fitting well even in the narrower spaces of your home. Although the thermoelectric wine coolers are supposed to be quiet, there are some complaints about the noise made by this unit. 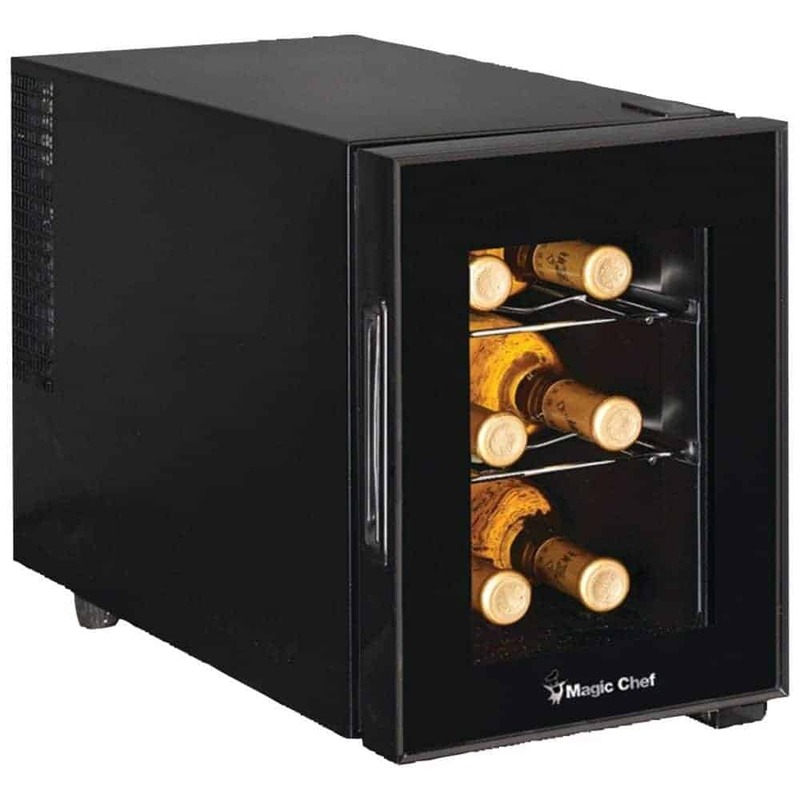 A very compact thermoelectric wine cooler, ideal for those who want to preserve only a few bottles of wine, is this Magic Chef unit designed to hold up to six regular size bottles. Due to its reduced dimensions, the unit is designed as a single zone wine cooler and can preserve or chill your wine at temperatures that range between 46 and 64 degrees Fahrenheit. The wine cooler is equipped with three chrome shelves that are removable, so if you have a smaller collection or need to accommodate larger bottles, you can easily change the internal configuration. Modern design: this wine cooler is designed as a modern black cabinet that can be placed anywhere in your house as a countertop unit. Perfect for a gift: with an affordable price and compact dimensions, this wine cooler can make a perfect gift for any wine enthusiast. Internal light: you will be able to admire or to show your collection of wines thanks to the soft internal light. Leveling legs: if you want to place the unit on an uneven surface, you can adjust its position thanks to the convenient leveling legs. It seems that this unit is pretty noisy, which might be irritating for some people. Another compact thermoelectric wine cooler with a single cooling zone is the AKDY® 8 Bottle Single Zone Thermoelectric Counter Top Freestanding Wine Cooler. This unit boasts a sleek design and has an internal capacity of up to eight bottles. However, depending on your needs, AKDY manufactures other seven versions of this unit, with capacities up to 32 bottles. The wine cooler is equipped with a soft blue light that will let you admire your wine collection, while the dark double tempered glass door will keep your precious drink away from the negative effects of the light. Adjustable temperature: depending on your necessities, you can set the desired temperature between 44 and 66 degrees Fahrenheit. Digital controls: the unit is equipped with a Touch Sensitive control panel that will allow you to set and control the temperature easily. Removable shelves: this wine cooler is equipped with two chrome shelves that are removable, so the unit can accommodate even larger bottles. Dual metric system: you can set the temperature in either Celsius or Fahrenheit degrees. A few users complained about the cooler not getting cold enough. However, you shouldn’t forget that this is a thermoelectric unit. 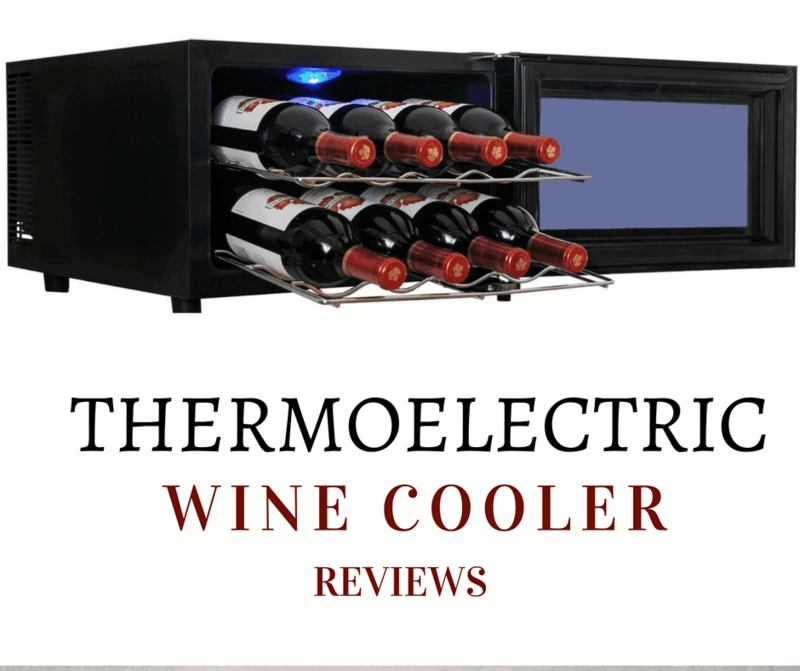 The last thermoelectric wine cooler reviewed is this Avanti 12 Bottle Thermoelectric Counter Top Wine Cooler. As the name says, the unit can accommodate up to 12 bottles, four of which can be stored in an upright position rather than on their side. This might be a great feature especially if you want to store some opened bottles. The chrome shelves are removable, so you will be able to change the internal configuration of the unit if needed. Intuitive controls: the control panel of this wine cooler is really easy to use, giving you the possibility to set and control the temperature and to turn the light on and off. Celsius/Fahrenheit option: depending on your preferences, you can choose to display the temperature in Celsius or in Fahrenheit degrees. Stylish look: the wine cooler has a black cabinet and a curved glass door, fitting well in all homes. Lock control feature: the controls have a locking feature, so you will be able to prevent having the settings accidentally changed. 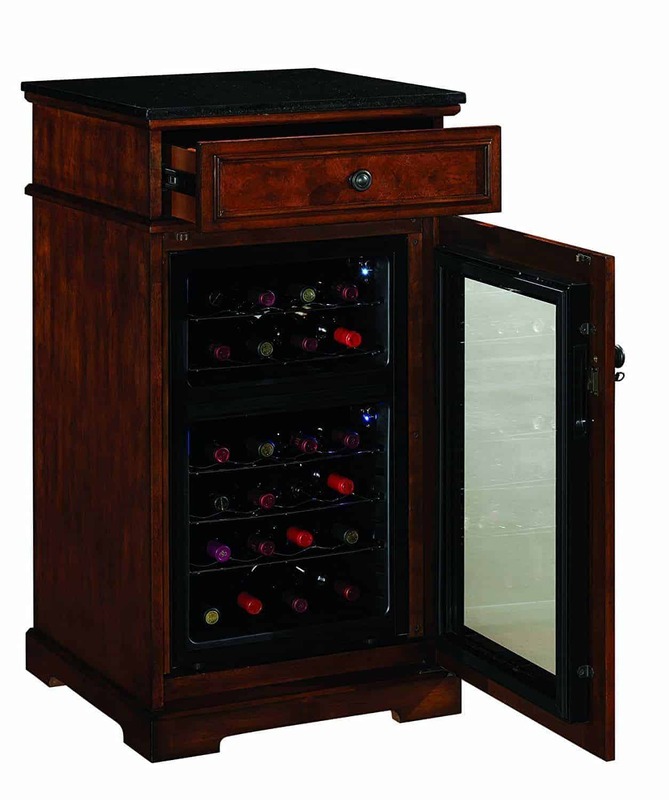 This wine cooler is designed to accommodate standard size Bordeaux bottles, so you might find it difficult to fit in other types of wine bottles. 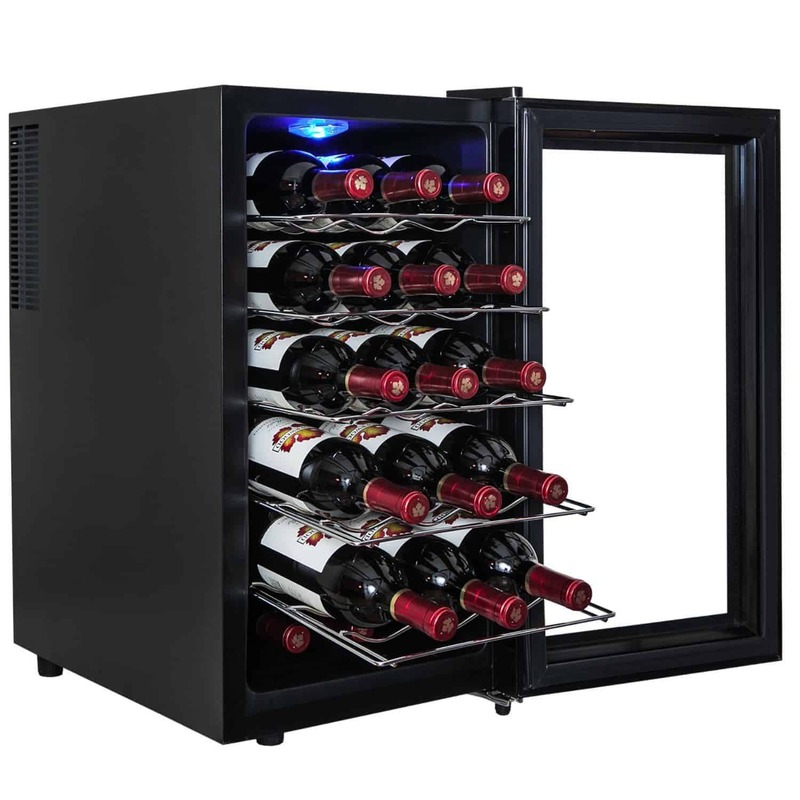 As you can see, depending on your preferences and needs, you can find the right thermoelectric wine cooler for you. Our favorite thermoelectric wine cooler is the Madison Thermoelectric Wine Cooler. This unit is not only versatile, featuring two temperature zones, but its elegant design makes it a match for any home décor. In fact, this stylish wine cooler is more than an appliance and it can be successfully used as a piece of furniture that you can place either in your home or in your wine cellar. The convenient drawer is perfect to keep close to your bottles any necessary wine accessories, such as a bottle opener. In this way, it will be really easy to open a bottle of wine whenever you want. We feel that this wine cooler is more suitable for preserving and chilling a collection of red wines instead of preserving a mixed collection. However, you can use this appliance for the storage of any type of wine. The capacity of 24 bottles refer to standard size Bordeaux bottles, but the shelves can be easily removed if you want to store larger bottles. Another feature we really like is the locking door. Not only it will allow you to keep the wines away from the reach of children, but if you have a collection of expensive wines it will help you keep everybody away from your precious bottles. The only downside of this unit is that it has difficulties in maintaining a constant low temperature.However, you should take into account that all thermoelectric units struggle with maintaining low temperatures. However, the versatility and the stylish design of this wine cooler, together with its reliability, make us consider the Madison Thermoelectric Wine Cooler the best thermoelectric wine cooler available on the market.